It’s hard to believe that as of today it has already been a full week since little Annabel was born. Where did all the time go?! Just kidding. It has ONLY been a week. But it did go by fast. One important thing Annie did this week was go to Dr. Looove’s office for her first well baby visit. Everyone there was really excited to see Annie, and they all made a big fuss over her which was awesome. Annie, for her part, did a lot of charming by opening her eyes and flashing a few gas induced smiles. Later, in the exam room, she impressed everyone even more by hardly crying at all when she was weighed. She did, however, pee on the scale. That probably is a bigger faux pas, isn’t it? Oh well. No one seemed to mind. You can get away with a lot by being tiny and cute. Dr. Looove soon entered and examined Annie. She was thrilled to hear how far gestationally Heather had carried Annabel. She gave the baby a thorough examination and proclaimed her perfect (but we already knew that). Dr. Looove then asked Heather and me how we were doing. Dr. Looove is our doctor, too, and the way she cares about our family makes us feel so special. We walked out of there happy but wistful. Maddie was a very beloved little patient at the office, and it was sad to be there without her. Still, it is nice to know that Annie will be taken care of by people who loved her big sister so much. We then made our way over to Dr. Risky’s office. After going there for more than thirty appointments during our pregnancy with Annie, it was nice to finally walk through the doors with her in our arms. Dr. Risky, after checking out Annie and commenting on her chubby cheeks, removed the staples from Heather’s c-section. She also consulted with Dr. Blood, and they decided that Heather should continue to take her blood thinners for six more weeks as people with clotting disorders are more susceptible to clots after surgery. Heather isn’t exactly ecstatic about continuing the shots, but is okay with it as she can see the end of the road ahead, as they say. Yeah….like pooing on the table when the dr. takes the rectal temp. My firstborn did that. ………..and if you have a baby boy……..it’s a STREAM on the scale!! My 3 grandsons ALL made streams on the scale with their first newborn checkup, lol! My daughter, who is 5, laughs hysterically at the commercial with the little baby boy who pees the second his Daddy removes his diaper and proceeds to hit the ceiling and several other objects around the room. She also makes us rewind it. My son laughs his head off when he pees on people! He has come THIS close to getting Mommy right in the mouth! Now that is a faux pas!!! What a precious baby. Oh my… I just want to bite those little cheeks. I am so happy to see that everyone is doing well. .-= Steph´s last blog ..Freaky Friday-Things That Make Me Go UGH! =-. oh my goodness!!! she is too adorable for words! .-= erika´s last blog ..This Is Why I Don’t Cook! =-. Happy one-week anniversary! And Annie, please, please don’t lose that hair. Oh my gosh, she is gorgeous. Congratulations to you both! She is an adorable baby, and Maddie is looking down at her from heaven watching over her! I am an avid knitter and would like to to if I knit a special baby blanket for Annie would you mind? .-= Katrina´s last blog ..I Believe…. =-. Happy Week-iversary Spohr family! And as a nurse, know that peeing on the scale is NOT a faux pas. Peeing on the -nurse- however….. The bath is still torturous for my 8 month old, but she too likes to rock her silky smooth locks. Actually, they get a bit curly, which I adore. Holding out hope that it stays curly (coming from a girl w/ stick straight hair). Anyway, can’t believe it has been a week! Happy 1-week-birthday! Happy first week, baby Annabel! You’re so beautiful! .-= Noelle´s last blog ..Dude, seriously…there’s a sign on my front door that says NO SOLICITING and YOU’RE STILL TALKING THROUGH THE CLOSED DOOR after I point that out?! =-. Ha! Ha! Noelle. I feel the same. p.s. Look how sympathetic Rigby looks. What a sweetie. She sure looks like dad! My son is only 8 month old, but seeing your lovely Annie it makes my heart and loins ache for another! Here’s to a lifetime of awesome weeks together!! Yay, I’m so glad everything is going so well! One week already. Before you know it you’ll be investing in a big stick to keep all the boys away! Happy 1 Week Birthday, beautiful baby Annabel. Congratulations Mama and Papa Spohr. I’ve so enjoyed reading today’s up-date about the pretty little Annie, Mike, your words have brought tears to eyes, just as Heather’s so often do. You are both such talented writers. And talented parents, the best. Your girls are so lucky. I hope you all have a peaceful, family week-end. Happy Weekiversary, Annie! She’s gorgeous. .-= amanda´s last blog ..weekend update: potty training, part deux =-. And hugs. Lots of ’em! She couldn’t be any cuter if she tried! Happy 1 Week Spohrs! .-= ClassyFabSarah´s last blog ..For the Love! =-. Staples???? I thought Dr. Risky was gonna do glue! She is so beautiful! I am so very happy for you all! So glad that things are going well for you all. I love the look on Rigby’s face in the bath picture … can’t quite tell if she’s worrying for the baby or happy it isn’t her! .-= Ruth´s last blog ..Getting ziggy with it =-. Wow – you got to wait a whole week before the first pedi appt? I had to take my babies in the day after they were released from the hospital – the doc wanted to make sure I didn’t have too much time to screw it all up. I love that hair, little Annie. I love her dark hair! I am just thrilled for you both! Have a wonderful weekend. She is a beauty! Love the extra little chin and the chubby thighs! You done good, Heather! Obviously every trial & tribulation of pregnancy that you answered with such courage has paid off. Enjoy your getting-to-know-you days! Being cute and small does have it’s adavantages I’m sure — you wouldn’t see any of us getting away with peeing on the scale at the Dr’s office! The bath picture with Rigby looking in is really cute!! Love all of the pics on Flickr too. Happy First Week Annie! I don’t know how it’s possible but you just get cuter everyday! Glad to hear everyone is doing so well! I think there will be another baby boom across the nation in about 9 months after seeing your pictures Heather. Yaye, so glad everything is good and healthy! Love the pictures. The bath picture is priceless and Annie looks absolutely happy and content and beautiful in the second. Sorry to be redundant but she’s so pretty. And so perfect. Just gorgeous. Love to all. What a beautiful child! .-= Ms. Moon´s last blog ..Winter Walk =-. Oh, you ended up with staples after all. I hope they weren’t too traumatic! Although they were certainly worth it! Annabel is beautiful! Congratulations again! .-= Porscha Is´s last blog ..A Bit of an Update =-. She looks so sweet!! I love newborns!! Yikes about the staple removing!! Hope you’re feeling ok Heather!! Annie is just beautiful!!! Love those cheeks! Have a super weekend as a family and looking forward to week 2 pictures! .-= Christy´s last blog ..Lance Armstrong: A Little Like Emma =-. Happy One Week Birthday Annie! .-= Anjie´s last blog ..Healthy again! =-. What a adorable baby. Very glad to hear everyone had a good check up. Love how Rigby is curious about Annies bath time. Rigby looks so sympathetic, love the look on her face! She is so gorgeous!! Happy one week Birthday Annie! Thanks Mike for the updates. Looking forward to Heather’s tale of the staples! So, so, so happy for all of you! That baby is beyond adorable. I’m so very happy for you guys!! .-= Domestic Extraordinaire´s last blog ..Everything is Going to be Okay =-. What a beautiful family!! Your happiness is much deserved. Pooping on the doctor. That’s how she could have topped peeing on the scale. And “Dr. Looooove” makes me giggle. Congratulations again. I hope Heather continues to heal nicely. Enjoy your new daughter; she looks like a sweetheart. .-= red pen mama´s last blog ..Classic =-. The scale traumatizes me, too, Annie. No worries! Happy one week on Earth. It’s a little messed up here, but it’s home. So cute! I love that most babies first bath pictures are of them screaming their poor little heads off. Eventually they just start looking around going “hey, this isn’t so bad after all”. .-= Teri´s last blog ..wordless wednesday: whatcha waving at? =-. Btw, Catie has been looking at your Flickr pics with me and asking about the baby, so she’s now singing a song she made up for Annabel. It’s basically just “Annie, Annie, Annie, Ann” to the tune of Twinkle Twinkle Little Star. Thought you’d appreciate that. I have Stevie Wonder’s “Isn’t She Lovely” in my head right now. She peed on the scale! Go Annie, make an entrance! .-= Amanda´s last blog ..Nurses are Mean =-. Oh sweet Annabel! I’m so happy for all of you! Happy 1 week birthday, Annie! You are beautiful! Love and hugs to your family…have a great weekend! My oldest daughter pooed on our family doctor at least twice…once the moment he delivered her! Annie is just beautiful. I know I’ve made that comment multiple times but it’s true!!! .-= JennK´s last blog ..Fat Camp, day 3. =-. Congratulations on a wonderful first week. And thank you for continuing to include us in your life. My own tribute to your inspiring story is up on my blog today. .-= Gale´s last blog ..Reluctant Inspiration =-. Maddie shines like the sun. 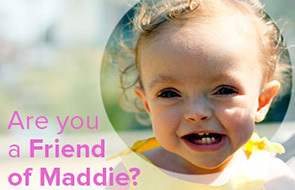 It is so easy to see why Maddie’s beautiful spirit touched everyone: doctors, nurses and strangers alike….it is that beautiful spirit that brings us all to your site…. I think of you everyday…I know this journey is not easy. wow, a whole week. It does fly by. I’m so happy for you guys and glad to hear that Dr. Loooove’s staff loves Annie as much as they loved Maddie. She is clearly in good hands there. That first bath is always a rough one isn’t it!! She clearly liked it once it was done. She is so adorable. Love and hugs to all of you. .-= Lisa´s last blog ..My Favorite Baby Product =-. I haven’t been this excited to see more Annie pics since my sister had her baby in August! She’s adorable and I look forward to hearing more about her. Thanks for the update….say hi th Heather for me please.So happy to hear all went well for you all and the baby. Like I said many times before, she is adorable ….so much so, it’s hard not to fall in love with! I am also very sad Maddie wasn’t there to see Dr. Loooove but, she, I’m sure was there in spirit! Thanks for sharing your prescious little girl with us all….that is such a wonderful gift to give us all! I love all that black hair! Glad to see that all the same people whose lives Maddie touched now get to know Annie. Ssweet girl! I’m glad all is going so well! Your blog makes me laugh, smile, cry, and pray. Thank you for sharing your girls and your hearts so willingly with all of us. Happy beginning to week #2…and beyond!!! Oh my Goodness, are those CURLS on top of her newborn head? I have never seen a newborn with curls! She is precious! .-= Toni Jones´s last blog ..Race Tracks with Daddy =-. She looked so peaceful and calm after the bath! So precious and lovely! God bless. I totally love you guys, for reals! And little miss Annie? well I totally want to just nibble on her cheeks!!! I am so happy for you guys! She is adorable, and I can’t BELIEVE that head of hair! LOVE first bath at home pictures lol! She is too cute. .-= Sarcastica´s last blog ..Take it with a grain of salt =-. I am so glad that all is well with the 3 of you. I know that it must be so hard to press forward without Maddie. but I am happy you have found joy in little Annie. She is adorable, as we all predicted she would be. Take care Heather and Mike. You are always in my prayers. Happy One Week Birthday, Annie! You are soooooo beautiful. Happy first week Annie (and Spohrs!). She’s too cute and adorable for words… those pics are the highlight of my day. Makes me want another one so badly!!!!!! love and hugs from NJ! I know unsolicited advice is obnoxious, but try the Tummy Tub, she may like it better (since it’s supposed to make them feel like when they were in mommy’s belly.) I’ve used it with both my kids and they both loved it, never cried during bath. Staples and blood thinning injections are for the birds. At least after 6 weeks they remain just a nasty memory… Wishing you a quick recovery! I wanted you to know that I saw the March for Babies badge on your blog page and decided to start a team that will walk here in Illinois. We want to do make a difference and in a small way, I hope this honors Maddie’s legacy. .-= ONE CRUSTY MOM-E´s last blog ..Time Moves Forward =-. She even looks perfect when she is screaming. Happy 1st week, Annie, Mom and Dad! Enjoy every second…she is beautiful, just like her big sis. What a beautiful baby! So happy for all of you… and just so you know, I for one, will never ever forget Maddie. i love that picture of Rigby with her little head over the tub. Have a happy friday.!!! Wow, a week already! Time flies when you’re in love. You guys sure make cute babies. She is beautiful!! Great news that everyone is happy and healthy! She is so beautiful. I love the way Rigby was watching. Have a great first weekend at home with Ms. Annie. .-= Heather@Triple Blessing´s last blog ..Girls day out =-. Peeing on the scale is nothing. You don’t make a real impression unless you pee or poop on the doctor! I can’t believe it has been a week either! She’s beautiful. .-= Kristie McNealy´s last blog ..Disney Live and Monster Jam Coming to Denver! =-. Next time, I think she should poo on the scale for good measure. Because that is how *I* feel when I have to get weighed. Actually, if I could throw the poo around the room, it would be more like how I feel. But, you know. I love how Rigby is monitoring the sitch in the bath picture :). Your posts keep making me cry… She is a little angel. A whole week already! Wow! She looks so fresh and soft and nice-smelling in that last photo. I love Rigby standing at the head of the tub. Happy first week to Annie! I am glad she is here to share her big sister’s light. Mike and Heather – you should write a book about your journey with Maddie. I for sure would buy it! You are both such talented writers, I love reading this blog, and pop over now and then to Mike’s blog. Annie is so stunning, I just love her! Maddie is the absolute BEST guardian angel! I hope the Spohr family has a wonderful, peaceful weekend. What a relief to hear that everything is ok! Glad to hear she is healthy and perfect! She is just beautiful. Sorry to hear about still taking the blood thinners though, but yes, the end is in site! Happy First week to Ms. Annie. She sure is a doll! Maddie (Annie’s guardian angel)must be so proud of her baby sis. It is always so exciting to get on the internet and check out what your family is doing….love the photos, and so thankful everyone is doing so well. I know you are missing Maddie, and I pray that the joy of little Annie will help with your saddness….she is a beautfiul baby….and she is so special that you have her right now – when you need her the most! love to you Heather, Mike, Annie & Rigby! I cannot get over how much she looks like Mike! She is beautiful. I am so happy for you guys!! First of all, GO YOU at braving the staples!! Secondly, she IS quite perfect. I think I might ovulate just looking at her little perfect face and hands and over-all adorableness. .-= Kellee´s last blog ..Frozen, Stuck, and Otherwise Paralyzed =-. I know you hate the shots my friend, but my mom’s good friend passed away in November from a blood clot in the lung. She was prone to them and the doctors took her off her coumadin, but didn’t keep her on baby asprin or anything. I was ask Dr. Blood and Dr. Risky if after the 6 weeks are up you should take an 81mg asprin every day. Annie is so incredibly cute. I’m glad she and puppy are getting along! Bath time will be fun when she’s old enough to play in the tub with toys! She is just perfect and precious! Love how cute she looks even when she is SO not loving the bath! Adorable!! ps. So glad that those yucky staples are outta there! Hope they weren’t too bad, Heather! I cannot get over how beautiful your daughter is! .-= pamela @VampireSmitten´s last blog ..Protected: Its not just me. =-. Ah, it’s so nice to wake up to fresh baby pictures in the morning. Wow! A week already?? She’s beautiful. Yes, here’s to many more weeks! She has such a wonderful complexion. She looks like a strong little girl and happy. .-= Ashley´s last blog ..A Oneder* =-. Happy One Week Birthday!! I wonder if you already feel how extra special you are to your mom, dad and Rigby? I may never have or never will meet your family, but I sure am glad I got to be a part of you coming into this world! And, it’s kind of special – you have the best guardian angel anyone could ever have…Maddie is sure to be right by you at every step of the way. .-= thatgirlblogs´s last blog ..I must be on my iPeriod. =-. Most precious first bath photo! Love that crying image of her! .-= Pamela @ 2 Much Testosterone´s last blog ..I wouldn’t call this a pet peeve, it’s more of a "WTF is wrong with people" gripe! =-. Just amazing!! I hope you had a phenomenal 1st week….and enjoy a lifetime together! Such sweetness…absolutely gorgeous!! Happy one week birthday precious Annie! Oh, my heart melts every time I see her pictures! Yeah…peeing is by far NOT the worst thing Annie could have done ~check out my blog post. (you’ll see what I mean) Funny, that I wrote about mine before you wrote yours and yet they still connect. So happy you have had a wonderful week with your beautiful daughter! .-= Amanda´s last blog ..Babes in Slumber =-. OH! I haven’t checked in a few weeks or so and look what I missed!!! Congrats! She is just precious and so perfect! She is just a doll baby!! She is gorgeous… and peeing on the scale isn’t so bad… my nephew peed in my sister’s mouth when he was about a week old. Lesson learned… keep mouth closed when changing baby boy!! Awww, what happened to the content look Annie had when she was getting her hair washed at the hospital?? Perfect family bathtime photo. Rigby is determined not to miss out on the fun! She’s gorgeous, but then you already know that. I also had to do heparin throughout my pregnancies (2) and had to continue the shots for 6 weeks following, but you already know it’s all worth it. wow…just wow. i saw the post on annie’s birthday, but i’ve been so busy i didn’t catch up with all of the other new baby posts until today. i am beyond thrilled for the 3 of you! i have been keeping heather in my thoughts and wishing her a healthy delivery…so so glad to know everything went well and that you were all present for the birth. annie is beautiful! you are such lucky parents. and she is one lucky kid. I CANNOT believe that Annie is already a week old. Wow. Its crazy how she was just inside Heather’s belly and now she really and truly is finally here. You two must be ECSTATIC! And “baby’s first bath at home”: Awww, how cute! ;o) I’m glad everything went well at her check-up. Annabel is beautiful! Enjoy every minute! So glad everything’s going well with both Heather and Annabel. Thanks for sharing the pictures! Happy 1 week in the world, Annabel! I can practically smell her sweet head from here (I hope that doesn’t make me sound creepy!) She’s lovely, and I’m so glad that you have Dr. Loooove in your life. It’s bittersweet, to be sure, but so good to know you are all in the care of someone that cares about your family from such a holistic perspective. I sound like an idiot. But I’m sure you know what I mean! She is absolutely gorgeous, your gene pool is amazing. She’s just as beautiful as her sister Maddie. .-= Susan´s last blog ..Fun Fact Friday =-. I am so happy for you both and so captivated by her sweetness. That is one gorgeous baby girl Keep it coming! This baby is gorgeous. And my beautiful baby peed on the scale too. .-= Wendy´s last blog ..Daddy’s Gotta Have It – A Movie Noodle Valentine’s Day Giveaway =-. So my mom just informed me that not only did I pee on the scale as a baby, I also peed on the doctor. However, i think I have turned out pretty okay and haven’t peed on anyone in years…unless you count that time that I was sitting on my boyfriend’s lap and was laughing really hard and might have accidentally peed. Just a little bit. .-= Rachel´s last blog ..New New New =-. She’s beautiful, in the picture after the bath, as soon as I saw it, I said WOOAAHHH!!! She looked just like you, I could not believe how much so, they say my daughter is a mini me, but I can’t see it, so if you can’t see it yet, let me confirm, she waaaaaaaaay looks like mommy!! Thats a good thing mom is beautiful too!!! Hoping many joyful days ahead with your lovely Annie! .-= vanessa Jordan´s last blog ..Why does it take us so long to CHANGE? =-. She is absolutely beautiful! I know how proud you and your Angel Baby must be. It’s like she has a gorgeous tan! You two make pretty babies. .-= Tina´s last blog ..Theme dinner parties =-. Again, that HAS to be the most beatuiful baby ever..next to my two kiddos! Congrat’s! Glad to see everything is going good! So, I have the perfect plan (lol). My godson is now 7 weeks old and the most handsome little boy you could meet. Annabel is obviously the most beautiful little girl in the land!! I think they will make the perfect couple someday!!! And have the most beautiful babies together ! So happy for your family, and thanks a million times over for sharing her with all of us internet folks. I love the last picture. She looks like a wise soul already. Oh, Rigby, with his head peeking over the bath tub- so cute! Happy first week birthday, Annabel! She is so beautiful. .-= Candi´s last blog ..Shrimp Étouffée =-. At Alison’s first newborn check up, she projectile pooped when they laid her on the scale, which also hit the wall… the floor… and the midwife. I could stare at photos of Annabel all day long. It’s too bad my monitor doesn’t allow me to sniff her head! .-= Andrea’s Sweet Life´s last blog ..The Good, The Bad and The Ugly =-. .-= Kelly´s last blog ..A new baby’s mama =-. She doesn’t look like Maddie, well I don’t see it yet. And I’m glad for that. Maddie was unique, NO one will ever be like her. And now Annie is here and she is unique in her own way. I like it like that. BEAUTIFUL BEAUTIFUL BEAUTIFUL! Congratulations! She has quite an energy about her, it’s obvious in the pictures, like an old soul…I’m so happy for you all. Many congratulations for the current road you’re on, the sunny yellow brick road is what you deserve..(and I’m sure some sleep)..
you guys are the reason why I believe in families. And here I thought only boys peed where they shouldn’t. Glad to know that girls are just as percocious. She looks so unhappy in that bath but I bet she felt tons more relaxed after…and you can tell by her picture that she was ready to nap. You’d pee too if you sat naked on a cold scale, LOL. She’s precious (although looking perhaps a touch jaundiced?). My kids weren’t fond of the little tubs for awhile. Having a bath with Daddy in the real tub (so they could ‘resubmerged’) always made them feel better. Some babies really like those tall, skinny tubs, popular in Europe I think. A shower sling was a lifesaver with my third baby—I had more showers in the first 9 months with that baby than I had with the first two babies combined, LOL. Whenever I hear a mom say she hasn’t been able to shower because of baby, I always suggest a shower sling. Oh, my kids are reminding me of how babe #3 pooped big time while waiting for the doctor and got it all over her clothes and I hadn’t brought spares, LOL! .-= TracyKM´s last blog ..Things I Have (Not) Learned. =-. Annie is adorable! So amazing! I could not be more happy for you guys! Maddie will for sure be watching over her baby sister! I use to read your (my husband read Mike’s) blog when my husband and I were trying to get pregnant in 08′! I loved the updates and just couldn’t get enough of Maddie! We got pregnant and had our baby girl Oct 2nd, 2009! I haven’t been on your site since I was about 5 months pregnant. This may be selfish but it was a little too much for me to read about Maddie when I was pregnant with my own daughter. But I continued to pray for you both! It’s been 3 months since we had Jocelyn and we just got home from being in the hospital (CHOC) with her for a week. She had a viral infections which settled into her lungs. Then she got a fun bladder infection that kept us there longer. It’s been a total rollar coaster. Anyways, I kept thinking of you guys (is that weird? LOL) and wanted to see if you had the baby yet! I was so excited to see the event went so well! I had been praying for you and your family! So happy for your family of 4! Oh wait, 5 with Rigby! I read but rarely comment, but I just wanted to say I am so very happy for you guys. I look forward to seeing more of little Annie. .-= ShellyD´s last blog ..Experimental Hot Dog Night =-. and i am totally addicted to your flickr stream. babies are so great. She’s just beautiful and perfect!!! I’m glad you guys had such a great first week. i have to ashamedly admit that i have been following your blog for quite a while but have not left a comment. my heart has soared with you and broke with you. i just have to say my heart is so full for you all right now. your little annie is just precious! congratulations. you all have been through so much! so thankful for this amazing gift! Ah the joys of bathing babies… They dont always love it the way do! .-= Michele´s last blog ..January Goal- Success! =-. Also, she is TAN. One would think she developed in a little tanning bed in Heather’s stomach for these past months – lordy, color me jealous! .-= gorillabuns´s last blog ..to do or not to do, that is the question =-. Oh Heather…. that underwear shot is all kinds of awesome. Awesome! I like to over-use the word AWESOME. Heh. .-= Ohmommy´s last blog ..Something, I never told my mom… =-. I can only imagine how thrilled all of the doctors and nurses were to see you two walk in with your beautiful daughter! What a cutie! yep she definitely loves the after being pampered treatment!! .-= just add walter´s last blog ..Gracie and I need your help!!!! =-. She is sooooooooooooo beautiful! congratulations! aaaawww she was all cold and wet mama! lol I’ve always found it strange that newborns don’t like being in the bath. You’d think it would be more of a home away from home for them.